In the past, computing typically was performed within highly integrated host-centric enterprise computing centres. While sophisticated distributed systems existed, they have remained specialized, niche entities. Over the last decade, however, computing has become increasingly concerned with collaboration, data sharing, and other new modes of interaction that involve distributed resources. While no one would argue that this paradigmatic shift was mainly due to the phenomenal growth of the Internet, the emergence of Grid computing technologies actually plays an important role. The Initiative currently involves six departments from five local institutions. Furthermore, the Initiative will also collaborate with the China National Grid (http://www.chinagridforum.org) and the Asia-Pacific Grid (http://www.apgrid.org) in research and development. Table 1 summarizes the current membership. The construction of the HKGrid test bed started in October 2003 and is still in progress. Table 2 outlines the major events throughout the construction process. 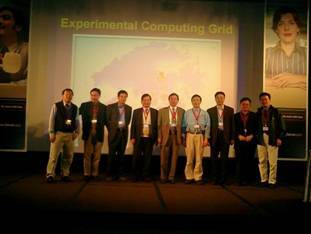 In December 3, 2003, the Hong Kong Grid Initiative was established officially in the banquet of the 2003 IEEE International Conference on Cluster Computing (Fig. 1). The details of the opening ceremony could be found at http://hkgrid.org/OpenCeremony.html. The Grid points in the HKGrid are interconnected by the HARNET (The Hong Kong Academic and Research NETwork). Table 3 outlines the computing resources on the HKGrid. System monitoring is important to Grid applications due to the highly dynamic nature of individual components. In HKGrid, the real-time system status could either be retrieved from the Monitoring and Discovery Service (MDS) of the Globus Toolkit (GT) (http://gideon.csis.hku.hk/LDAPExplorer/), or from the Ganglia Toolkit (http://gideon.csis.hku.hk/hkgrid/). The MDS service supports a variety of GT-based applications, while the Ganglia Toolkit features comprehensive graphical interfaces (for system administration) and the use of XML data format (for application development). Fig. 2 is a snapshot of the HKGrid¡¦s status produced by Ganglia. The progress of constructing the HKGrid test bed indicates the commitment of the participating institutions on Grid computing research and development. We wish to finish the remaining construction work (e.g., migration from GT 2 to 3, etc.) and to start experimenting new Grid middleware and applications in the coming months. In particular, we are currently designing several research prototypes: (1) a software management toolkit for remote, on-demand, construction of execution environments on computational Grids; (2) a Grid-enabled simulation platform for building intelligent transportation systems; (3) the G-Pass, an instance-oriented security system for supporting mobile agent applications on Grids; and (4) the G-JavaMPI, a Grid middleware for supporting Java process migration and post-migration message redirection.